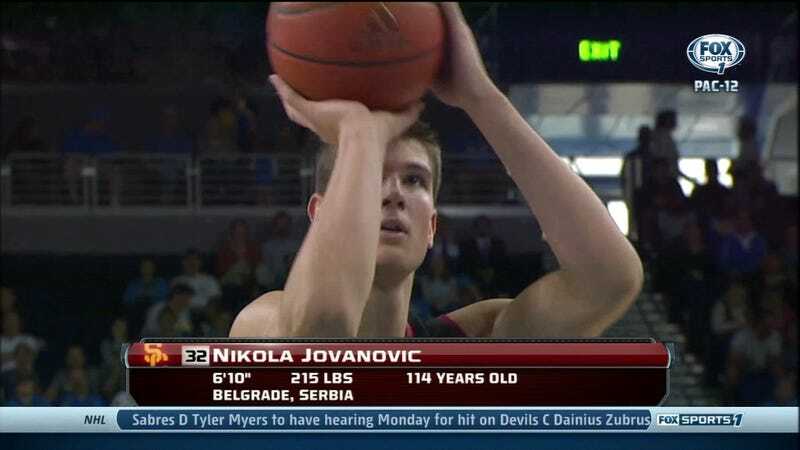 USC freshman Nikola Jovanovic is a frontcourt star for the Trojans, but we have to wonder what age-defying magic they've got over in Serbia. Can they get some to Novak Djokovic? We'd love to watch him dominate tennis for another 75 years. Fox Sports 1 wasn't the only network with chyron problems this weekend, though. CBS declared Kansas freshman Joel Embiid to be, apparently, from "parts unknown." That or Cameroon, I suppose. At least CBS didn't declare him to hail from Deepest, Darkest Africa.